Rewind << Born in Romania and raised in Toronto, Simina Grigoriu has called Berlin home for several years. The pearl on the river Spree has been the creative epicentre for Simina’s musical expression and has sharpened her natural feeling for beats and sounds. Each of Simina’s sets tells a new story and makes her cultural roots known. While taking classical violin and keyboard lessons in her early childhood, Simina’s enthusiasm for music grew steadily. From the vinyl treasures of her parents and the Hip-Hop freestyle of her student days, Simina’s sound gradually took on a style all its own, which she has explored and remained faithful to till this day. Her musical development would later take on a whole new twist in the clubs of Toronto. The influence of Jeff Mills, Adam Beyer, Josh Wink, and Juan Atkins, to name a few, kindled Simina’s love for techno music – a genre whose versatility captured her imagination, and which she would not be able to pull herself away from. Play > A few years ago Simina appeared as a bright new star in the techno sky and released her first tracks with various labels. 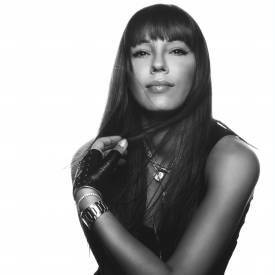 Her release with the Berlin label Sonat Records was followed by releases with Phase Insane Records in Spain, Intelectro Vibe in Italy, Urban Sound and Frequenza Records. With the first huge smash in her career, Simina released her chart storming debut album EXIT CITY with Susumu Records. Fast Forward >> After almost exactly twelve months Simina Grigoriu has resumed her station behind the turntables. Creative pause? Wrong! Simina has become the mother to a baby daughter, and, as befits a full-blooded artist, has not let the time elapse without music. With the fresh impulses of motherhood, the artist fine-tuned her new tracks during her pregnancy, which have also just been lifted like a baby from the baptism. In playful tracks full of positive vibes and a solid dose of techno, Simina returns on November 16, 2015 with her first comeback release on Form Music. It is impressive to see with what energy and vitality Simina Grigoriu masters the balancing act between family and music. She remains true to her unique sound and is now, above all: a full-time mom with the vision to be led deeper into her music by an ever-present instinct for play.